The latest monthly economic chartbook released by Jadwa Investment found a cooling in some key economic data points, although the Saudi stock market soared by 10% in January as oil prices rose. The Riyadh-based Jadwa’s report found that POS rose by 10 percent while cash withdrawals were flat, and non-oil PMI index was marginally down to 54.4 in December. SAMA FX reserves declined by $7.8 billion month-on-month. The net monthly change to government accounts with SAMA was down by SR62 billion ($16.5 billion) month-on-month in December, affected by a decline in government reserves. 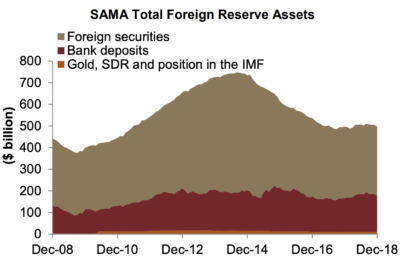 SAMA foreign reserve assets declined by $7.8 billion month-on-month to $496.6 billion in December. 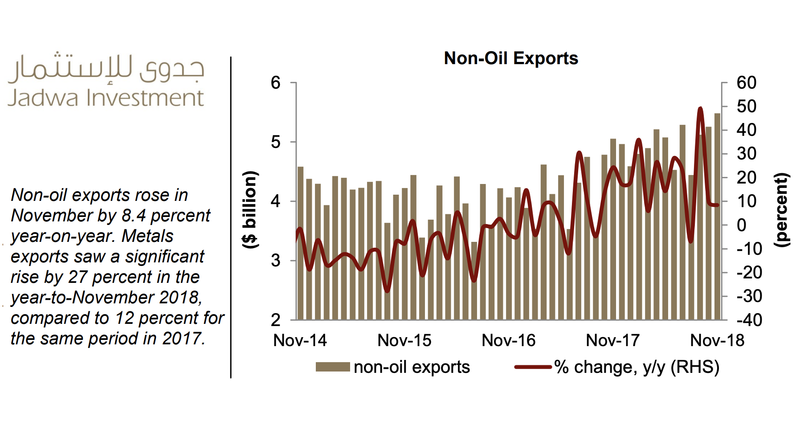 In addition to the growth in the Saudi stock market, positive signs were found in non-oil exports, which rose in November by 8.4 percent year-on-year. Bank deposits in the Kingdom rose by 2.6 percent year-on-year in December. Private deposits saw a significant rise by 3.3 percent year on-year, affected by a continuous rise in time and saving deposits, Jadwa said.